The majority of Americans do not have a few thousand dollars to weather an unexpected illness, job loss, or accident. Most Americans, including 80 percent of people of color, are locked out of the mainstream economy, unable to add their talents, work, and dreams, unable to share in the bounty of this economy. Without a nest egg most Americans cannot invest in their future—and the future of our country—through saving, entrepreneurship, education, and homeownership. We can—and we should—do better. 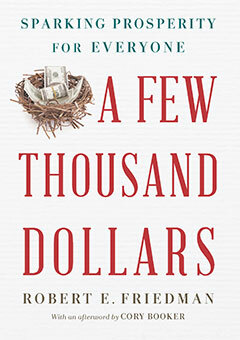 Longtime leader in the field of asset-building Robert E. Friedman demonstrates how a few simple policy changes would address wealth inequality—and build a better economy and a stronger country for us all. In six sharp, compelling chapters, accented by sixteen original black-and-white illustrations by Rohan Eason that present the realities of income and asset inequality and explain the needed policy interventions, Friedman addresses savings, business, education, home, and prosperity to articulate a vision for making inclusive investments without spending an additional dollar, just by transforming tax subsidies for the wealthy few into seeds for prosperity for everyone. This is an investment with a huge return: the redemption of the American promise of prosperity for all.